Live just steps from the Beltline in one of the largest condos in Grant Park! Spacious townhome-like 3-level unit has hardwoods throughout, 1-car gar. w/ storage area, working fireplace with built-in casement cabinets, covered balcony, dry-bar area, an extra den/office area, and a master suite with separate tub and shower. There's even pull-down attic storage! Community has several extra exterior unassigned spots for permit parking as well. Units this size don't come up very often in this community so come and get it! Driving Directions: From I-20, take Boulevard exit. Go south on Boulevard, left on Robinson Ave, park on street at end of Robinson Avenue, walk a few feet over to unit 62. 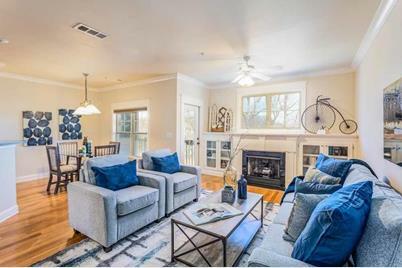 655 Mead Street SE #62, Atlanta, GA 30312 (MLS# 6515391) is a Condo property that was sold at $339,900 on April 15, 2019. Want to learn more about 655 Mead Street SE #62? Do you have questions about finding other Condo real estate for sale in Atlanta? You can browse all Atlanta real estate or contact a Coldwell Banker agent to request more information.